Whether you are a beginner or a seasoned sign maker, you need to be on the lookout for the best vinyl cutter plotter that you can get your hands on. A good quality plotter will help you effortlessly cut your designs while a bad one will only lead to failure and frustration. This machine features two fully adjustable pinch-rollers that gives you the freedom to try many types of materials. It has a Roland compatible blade holder, meaning you can use most of the blades on the market. The USCutter MH has its limits; it is not able to cut intricate, detailed decals but it still performs quite well considering it does not have a laser. It is simple to assemble and to use the software that comes with it. For an entry-level cutter, this is a solid choice. This machine comes with some useful items, such as a 12 inch cutting mat, cutting blade, and cuttable designs. The Cameo is strong enough to cut through such materials like vinyl décor, etched glass, sketch designs, scrapbook paper, custom apparel, and many more. 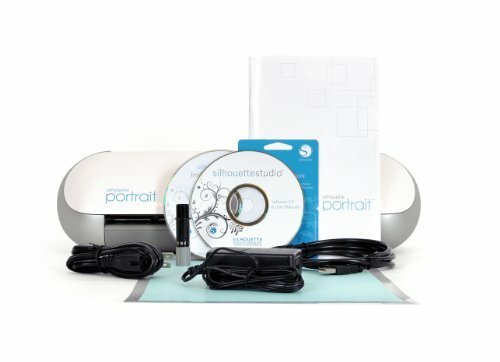 The Silhouette Portrait is one of the top cutting machines on the market today. It can cut through many materials like magnet paper, fabric, vellum, cardstock, vinyl, and other popular materials. This device comes with free PC and Mac compatible software. The software allows you to monitor the performance of the machine and customize your designs easily. There are 50 free designs that it comes with. Yet another excellent product from Cricut. 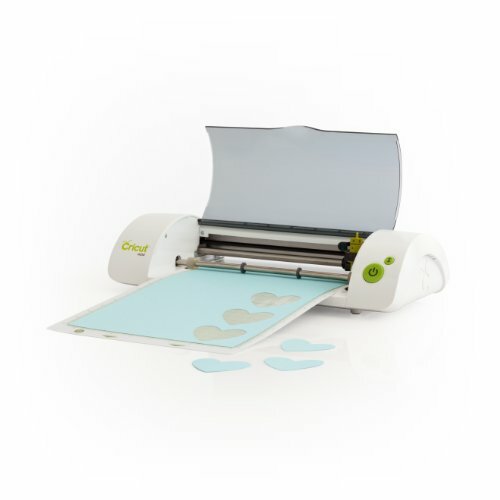 This portable device is great for scrapbooking, greeting cards, paper crafts, and the like. With it, you can cut designs 1-5.5 inches tall easily. You do not need to connect this device to a computer, it works standalone with cartridges. This cutting machines has plenty of useful features. It can cut materials of all shapes and sizes, and has a reputation for is precise cutting capability. It is also very quiet and compact, so you can enjoy the cutting experience without causing a racket or occupying lots of space. 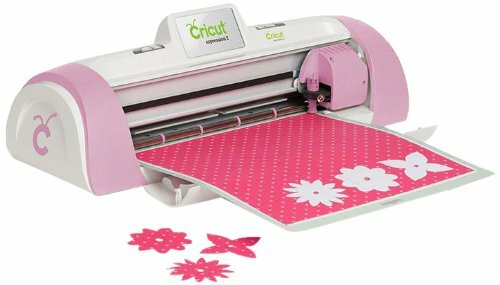 This device is compatible with all types of Cricut cartridges. The Expression 2 functions more quickly and efficiently than its predecessor. This device comes with software that allows you to monitor and track the performance of this machine. You can see the results from its full color LCD screen located in the center of the machine. 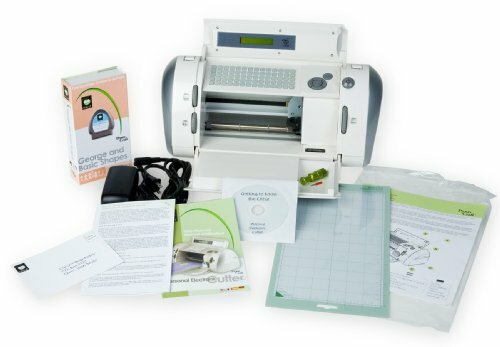 The Cricut Expression 2 allows you to cut images within 0.25 to 11.5 inches effortlessly. It is well known for its flexibility, has four complete functions and six different cutting modes so you have plenty of customization available. 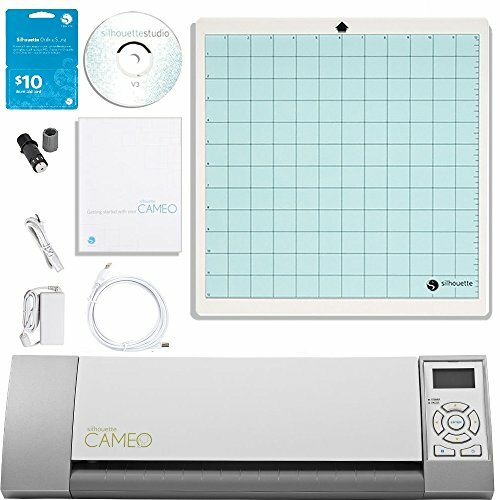 The Cameo Digital Craft Cutter has a maximum cutting force of about 210 g. Furthermore, it is also compatible with USB, SD, and also SDHC. This device will help you easily cut through lots of material and bring your designs to life. A vinyl lettering machine is a device that one can use to cut vinyl or similar materials into various letters and shapes. The machine is approximately the same size as a printer, however they can be as large as a billboard to print billboards and other large projects. Some devices must be connected to a computer a cable, others are standalone and rely on cartridges to receive information. Cartridges contain information on the graphic design that the vinyl cutter must cut out. The vinyl plotter relies on information contained within a cartridge or sent from a computer to know how to cut a certain design from the vinyl material. It works much like how a printer works but instead of pressing ink, it is making tiny incisions along the material. Once the printing is done, the material is to be removed, and any excess vinyl should be scraped off, leaving behind only the completed design. This technique can be used for card making, sign making, scrap booking, sewing, and various other crafts. Some devices are bundled as part of a kit that includes a single vinyl cutter and many cartridges for it to use. Machines that rely on cartridges do not connect to the computer. All it needs is a power source, a cartridge, and some vinyl (or similar material) to be fully operational. Vinyl graphics printers that rely on cartridges can be limited in the designs it creates because the designs in a cartridge are finite. The user may also simply not have access to certain cartridges that they want. However, this model of cutter is generally inexpensive and can be a good foray into the world of vinyl lettering. Users who want a more specific design must either have the specific cartridge that contains the design they want, or else they need a model that can connect to a computer. Machines that require a cartridge cannot operate without one. If the user loses or damages a cartridge, a new cartridge needs to be purchased. No designs are stored in the device’s memory. Thus, one must carefully select which cartridges they want and take better care of their cartridges. Other models of vinyl cutters must be connected to a computer to function. This gives the user freedom to create his or her own designs to be cut out by the plotter. Since the machine relies on the computer for instructions, all of the designs are stored on the computer instead of cards or cartridges. Once again, no designs are kept in the machine’s memory. For larger projects, one can find large-format vinyl cutters to help make big signs or other such projects. These machines can generally only work with vinyl. Rolls of large-format vinyl can be bought from specialty retailers. These devices can only work with specific software instead of bundling it up as part of the package when the cutter is purchased. Typically, several materials can be fed into the lettering machine. These cutters can handle vellum, cut paper, card stock, and of course, vinyl. Some devices can handle fabric that has a special interfacing backing. Before making a purchase, you will need to determine which material the cutter can cut, whether or not it relies on a cartridge or computer, and if you require special software to run it. A die cutter can be used on cardstock and paper as well as fiber, rubber, foil, fiberboard, foam, and even some sheet metal with some tougher models. Even basic models will cut and emboss, and advanced models can print, scan, weld, and draw. The most typical mistake someone can make when purchasing a vinyl monogram machine is considering only a machine’s speed, force, and cost. Over the last few years things have changed drastically, and there are many more factors one should consider like tracking, motor, contour cut image printer, and so on. A vinyl graphics printer has a drive motor that is either a servo or mechanical stepper motor. Stepper motors are affordable but loud and are not very precise when it comes to small graphics. On the other hand, servo motors are silent, smooth, great at tracking, and able to cut precisely on small paths. There is no contest, the top vinyl cutting machines today all have servo motors. If you ask any vinyl cutter operator’s opinion, you’d discover that when it comes to tracking ability, the drive motor is not the only thing to keep in mind. The consensus is that the lack or presence of a floor stand, the quality of the pinch roller assemblies, as well as specific features in the control panel all affect the outcome. Therefore, you should determine what size graphics you intend on producing. For instance, a basic entry-level plotter is more than sufficient for scrapbooking. If you are a very casual user, the only things you need to worry about are tracking and drive motors to select a decent machine for your needs. However, if you intend on cutting small fonts precisely and need tracking for more than 15 ft., then you will need to consider more factors when buying a plotter. For example, you will have to consider the tangential emulation as the tangential blades rotate and lift at corners so the blade will not bind. The tangential emulation orients the direction of the blade, providing more precision to the vinyl lettering machine, without suffering in speed or productivity. Nowadays, vinyl plotters need to transform printer images into contour-cut decals so the demand for better hardware that allows the cutter to optically sense printed registration marks has improved drastically. The best vinyl lettering machines today all contain these technologies that can only function with proprietary and technical software. Regardless of whether you find the best machine for crafts or for vinyl, a plotter with ARMS should come with the necessary software for the best print and cut graphics results. You should also look for one that has a media cut-off feature and adjustable pinch rollers. This will allow you to start each job with a straight, clean edge and prevent materials from being wasted. Remember to consider the die when buying a cutter and get one that is compatible with the most common die brands. An important factor for your vinyl cutter is how versatile it is because it should be able to provide cutouts in the most common sizes. Also, be wary of any safety precautions you must take to reduce chances of injury. All machines have many moving parts that can pinch and cut, and smaller models can have pieces that are choking hazards for pets and children. Warranty is also another factor to consider. The most common warranties range from six months to three years. When it comes to your budget, it all depends on how serious you are about this purchase. Will you simply use it for fun as a hobby, or do you intend on using it for professional purposes? Today, the highest performance lettering machines can go as high as $7000. What exactly are you getting for that kind of money? A 5.5 in/sec cutting speed and cutting forces of 20 to 600 g. You will be able to cut materials from high-intensity reflective film, self-adhesive vinyl, sandblast resist rubber, and so on. You’d get an LCD control panel, ARMS systems (automatically find registration marks and color variants), and Ethernet capability (connect multiple machines from one location). 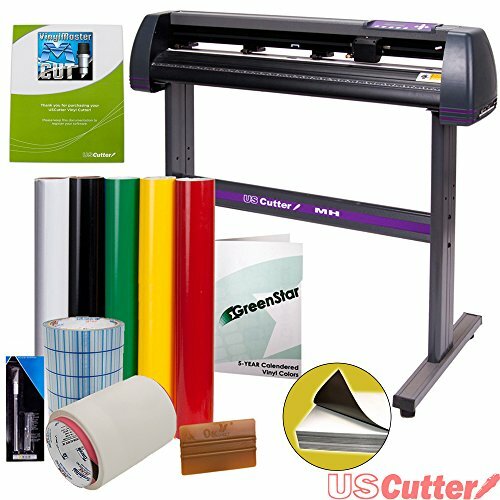 For around 500 USD you can get a cutter plotter that can cut decal and sticky vinyl, vinyl decorative scrapbook paper, various transfer media (colored paper, flock, PU vinyl), and inject dark/light transfer paper. This model would also come with a USB interface and can be connected to many computer systems. For the hobbyist, there are models in the $200 price range. For this amount of money, your portable vinyl cutting machine will come with a decent software to create or import your own designs. As to be expected, it is not suited for heavy use, and will not be able to cut certain materials for example balsa wood. However, for cutting paper, craft foam, vinyl, light weight fabric, tissue paper, and even rhinestone template material. This model will also be able to cut relatively complex and intricate designs.